“The reason I bought this particular travelling watch is because I appreciate the level of engineering and craftsmanship that went into its making. I’d been looking for something like it for a few years, but they’re often very tatty or have been neglected in the back of a drawer for 50 years. 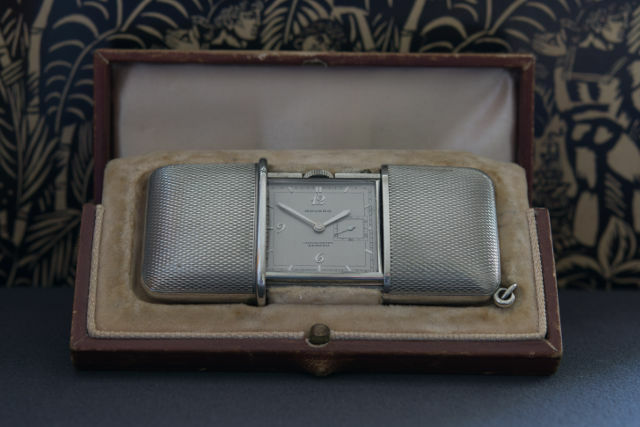 This one is made with steel and chrome, and has an uncommon grey dial with a style of numbers and hands that typifies the 30’s; as an aside, I like looking at items and buildings produced during the art deco period. I haven’t yet taken this watch when I travel – it gets wound every night and sits on my bedside table. Given appropriate circumstances I would have no problem taking it with me, something like a journey on the Orient Express where you aren’t getting rushed around, or dumping belongings in and out of airport security trays. It ticks away and is accurate to a couple of seconds per day which is great testament to its quality. It was made in the 1930s and is in stunning condition. To give you an idea of its size when closed, it would easily fit in the coin pocket of a pair of jeans. I’m not really a watch collector, but I do have more than one watch. I’ve been fascinated by them since I received my first one as a gift on my 8th birthday (in 1979) – it was a manual wind boys’ Timex – black strap, white dial. I wore that watch until I got a Swatch as a teenager. I wear a watch every day – I couldn’t be bothered with pulling out my mobile, unlocking it and then have to press some buttons to know the time or date. I wear the same 3 or 4 watches all year round, and it usually works out that I’m wearing the same one for about 6 weeks before I put on another another one, just for a change. I tend to favour classic designs, and nothing too ostentatious or large. Again, it’s the engineering and design of them that I appreciate.